Where to search if you’ve got money to spare. You know Boston Pads is here to help you find the best in Boston rentals 24/7. You know that they have a network of professionals to connect you with who are ready to help throughout the process. But BostonPads.com also has a fantastic infographic tool to help you compare and contrast average rent prices in Boston by town! Checking out the infographic got us thinking about the neighborhoods at the top of the charts–at least when it comes to rent prices. What sets them apart and makes them so worth it? Here, then, is the lowdown on the top five most expensive neighborhoods in Boston. Which one is your favorite? Back Bay: With it’s beautifully preserved Victorian brownstones, world-class shopping, in-town convenience, and gorgeous parkland, what’s not to love about Back Bay apartments? Located at the top of our list of rental prices, this is truly where everyone wants to be. Beacon Hill: Stepping into the Beacon Hill neighborhood is like traveling back in time. Surrounded by rowhouses, gaslit streets, and brick walkways, you’ll find all of the history and charm of Boston’s storied past in this elegant neighborhood. South End: With the best of Boston’s historic past and vibrant present, South End offers an array of beautiful Victorian rowhouses, greenspace, and entertainment and shopping venues. It is especially beloved for its diversity and art scene. Symphony: As its name suggests, the Symphony neighborhood is the epicenter of the arts in Boston, with not only Symphony Hall but also a variety of galleries, art schools and conservatories. Symphony is sometimes considered “East Fenway” but we evaluated it separately. Fenway: The final stop on our tour of the most desirable neighborhoods in Boston is Fenway, home of Fenway Park. Fenway is sometimes considered to encompass both Fenway and Symphony, but for the purposes of our statistical survey we evaluated them separately. Looking for the most bang for your buck out of the top five most desirable neighborhoods? While it might seem like a misnomer to call any of these neighborhoods bargains, you will find that some floorplans offer the opportunity to save over the neighborhood average. Studio Bargain: South End saves you $200-250 a month on average in their Studio Apartments meaning you can have all of the advantages of a great in-town location for a price usually found in more outlying areas. 1 Bedroom Bargain: One Bedroom floorplans tend to fall in price predictably based on the average rent in each neighborhood. No real bargains here. 2 Bedroom Bargain: Beacon Hill Two Bedroom floorplans are $150-200 cheaper than those in South End and Symphony, giving you a little break if you’re looking for a skosh more room. What makes all of these areas so worth it? Location, location, location. Being this close to the center of everything, foregoing a commute, and distilling all of Boston’s historical and architectural charm makes the difference. However, using the infographic can help you find areas that are undervalued, in some cases offering downtown convenience at suburban prices. Remember too to check out how floorplan makes a difference. You might find that you can get more than you expected if there’s an excess of listings in your chosen neighborhood. Whatever you’re looking for, if your priority is a prime in-town location these are the most sought-after areas of Boston. 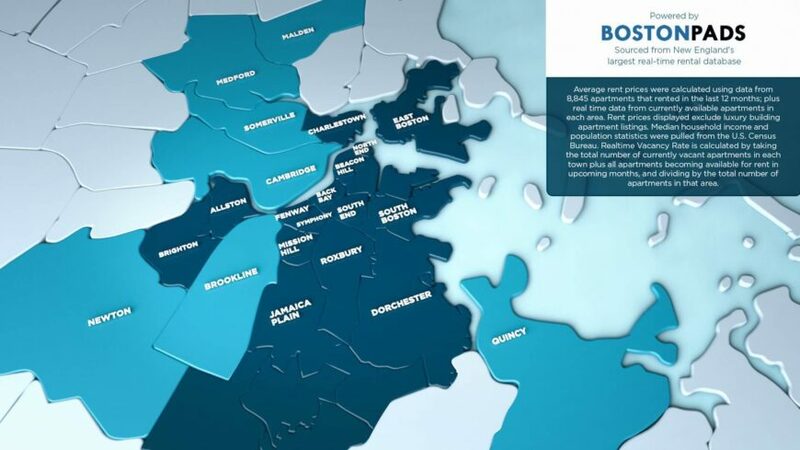 That high demand means you need BostonPads.com to help you find the right apartment right when you need to make a move. Let us help you get where you want to be. Use our apartment finder feature to find your dream apartment in Boston!